Model is an extremely versatile 24 Hour 365 Day Event Timer designed to support a wide range of applications. Such applications include: Home and Building Automation, Security, Access Control, Lighting Control, Etc. ADoAT4 is equipped with four independently controlled form C relay contacts that provide many latching and/or momentary operations during a program schedule of your choice. 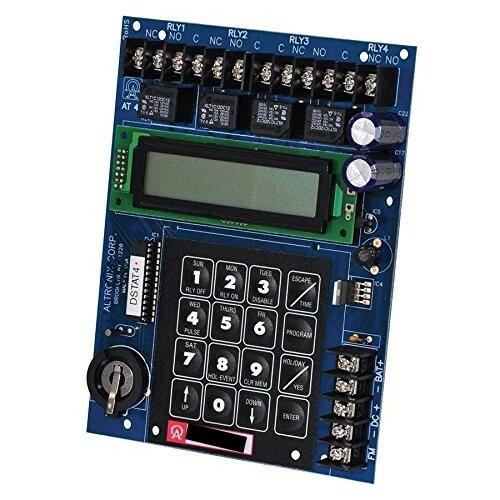 The EE prom memory allows for programming of unit prior to/or during field installation. Events may be set for single or multiple operations on a daily and/or weekly schedule. The block programming feature enables repeating an event on any combination of consecutive days. ADoAT4 will compensate for daylight savings time if desired. It automatically adjusts for leap year and is Y2K compatible. Individually selected holiday exceptions can be programmed to over-ride regularly scheduled events. • Standby current: 20mA with relays off combined with 40mA for each relay on. • Four (4) Form “C” relay contacts are rated 10amp @120VAC/28VDC. • EE Prom memory protects against loss of programming due to power failure. • Clock synchronization 60Hz (AC operation). • Accurate crystal controlled clock (DC operation). • 254 individually programmed daily/weekly events. • Block programming capacity can accommodate a total of 1778 events per week. • 254 programmable Holiday events. • First man in option. • Automatic compensation for leap year. • Each relay operates independently. • Built-in charger for 12VDC sealed lead acid or gel type batteries (Max charge current 300mA). • Lithium battery backup maintains clock. • User friendly keyboard programming.